I am so sad to hear of John’s passing. I own an arch top Guitar bought from John in 2003. To this day it is possibly one of the most amazing instruments ever crafted. So many great players have asked to use “The Liddy’ for a set at gigs and festivals. I know John loved to hear people playing his instruments, but it also gave me a sense of great pleasure to know that I had something of rare beauty…. it was the shaking of the head and the grin as these musicians handed the “Liddy back to me, I always wish John could have been a fly on the wall for those moments. Thankyou John Bridgland for this fantastic article. 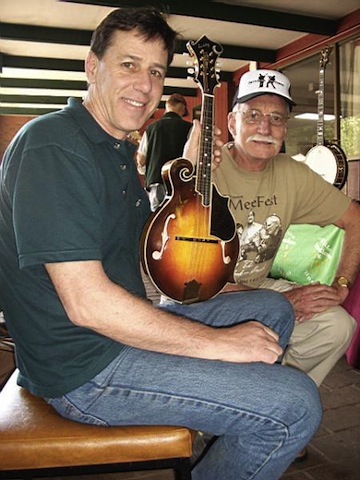 I have a deep respect for John Liddy, he was a life long friend and an incredible luthier. I’ve known John my whole life as he was my best mate and bandmate Matts’ dad. I remember when Matt and John made Matt’s first telecaster and what followed was amazing; an exciting journey for John, from building furniture to building music. It is a great sadness his recent passing yet a pleasure to discover that my new musical brother Luke Moller plays a Liddy mandolin. Thank you John, I will never forget the joy in your eyes when you heard the music your instruments made. John was a beautiful human being, I am sad to hear of his passing. I purchased an archtop guitar from him at the Wangaratta Jazz Festival.My condolences to his family. In 2001 I played the first mandolin John had ever made, I then had Trev Warner choose one from his first batch which I purchased. I now have two Liddy mandolins and have taken them all over Australia and the world where everyone has always been highly impressed by the sound and fine craftsmanship. I’ve even had Doyle Lawson & Adam Steffey play mine! I enjoyed every minute with John and will always remember him! I am deeply saddened to hear of John’s passing he was a wonderful bloke and he made beautiful instruments. I have very fond memories of John when we shared the Australian Instrument Makers booth at IBMA Nashville each year and the various Australian Festvals. John was a delight to be around and I respected his luthery skills and I was always keen to hear his gems advice. Everyone I know who own a Liddy Instrument treasure them. My condolences to his family. It was a true blow indeed to hear of the passing of John. He was an incredibly nice fella who always greeted you with a smile and we shared many an enjoyable chat about the ins and outs of mandolin building; its challenges, the vagueries of the market and how tired we were! I’ll miss you John. I am lucky enough to be the owner of a Liddy F5 mandolin. I also met John a number of times at festivals. John was a friendly and quiet man who made great instruments. Those instruments are his legacy to the Australian Bluegrass community. RIP John.